Brit milah is a sacred connection to past, present, future – J. Many Bay Area Jewish parents of newborns are conflicted about choosing between a brit milah (bris), a hospital circumcision, and skipping circumcision altogether. However, our family has a tradition of brit milah with a mohel, and we have found it to be not only a remarkably meaningful experience for those of us in the room but also a way of making a positive connection to our whole lineage — those who have come before and those who follow, l’dor vador. On Jan. 19, our son and daughter-in-law Mike and Allie Saperstein hosted a traditional brit milah at their home for their newborn son, Oliver. He is our fourth grandchild; the two other male grandchildren, Harry and Ezra, each had a traditional brit milah as well. Each encounter with this most holy ritual has been profound. I was given the honor of being the sandek for Oliver’s brit milah. 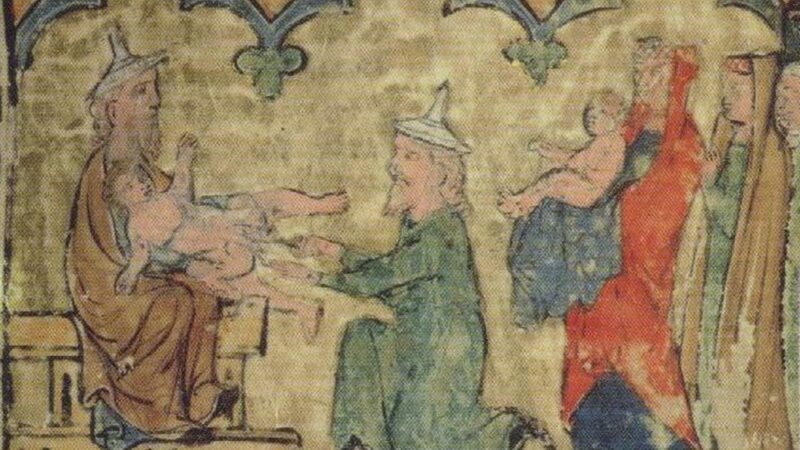 My duty was to hold my grandson’s legs in place while the mohel performed the circumcision. I felt Oliver’s body in kinetic connection as he underwent a trauma that his short eight-day life had given him no experience of or way of understanding. Allowing my whole self to be fully in the present, I deflected concern for the details, distractions that normally might have deterred me from embracing each moment. I released supervising, controlling and navigating, letting the magic of the experience — the now — emerge in both mystery and meaning. The success of the procedure depended on my total attention to keeping still. While so many beloved were in the room sharing witness, they were not where my attention was focused. Tears rolled down my cheeks as I sat in place — on task, yet transcendent. As a grandfather given the sandek’s sacred task, I embodied the living transference of the line of ancestors who were, those who are and those who are yet to be past, present and future. That is the wisdom of this ancient ritual. A grandfather’s tears increase the meaning of this visceral ceremony. I saw myself connected to everyone. I saw not just Oliver in my hands but also my two sons in my father’s hands and me in my grandfather’s hands. I was all the children being circumcised and all the grandfathers holding their grandchildren in compassion and lovingkindness: affirming the future, feeling the passing on of the elders in the continuity of generations. In renewing the covenant and the connection to our people and to God, we commit to repairing a broken world with lovingkindness, intention, acceptance, acknowledgment and freedom, and to making our lives a blessing to those who come to know us, including, now, little Oliver. Jeff Saperstein is a 40-year member and community leader at Congregation Kol Shofar in Tiburon.